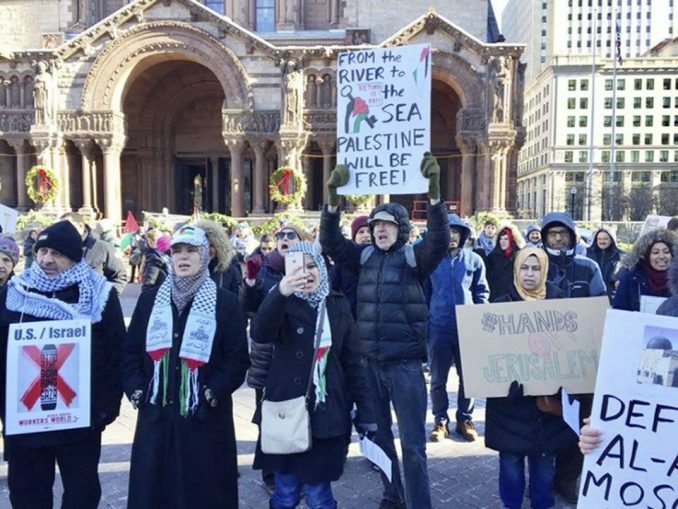 The sound of Palestinian Dabke music and chants of “Jerusalem is Palestine!” filled Boston’s Copley Square on Dec. 17. Community solidarity lifted up the struggle for Palestinian self-determination there in the face of Trump’s recognizing Jerusalem as the capital of Israel. The spirited rally was co-sponsored by a broad coalition of organizations, including the New Generation Club of Boston, Massachusetts Peace Action, Workers World Party, [email protected], Northeastern Students for Justice in Palestine, Team Solidarity of Steelworkers Local 8751 and the Boston Party for Socialism and Liberation.